The same Hamilton.The Russian market has come a new brand - Hamilton, part of the Swatch Group. The Russian market has come a new brand – Hamilton, part of the Swatch Group. How does it feature in what consumers calculated and how promising in our country? With the introduction of these issues begins with each new brand, So, meet – Hamilton. 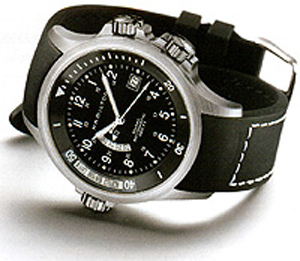 Hamilton was one of the last brands Swatch Group, which began to develop the Russian market. The reason is simple: Hamilton American brand, and the way these brands to the heart of the Russian consumer is much thorny than their European counterparts. Somehow it happened that American clock does not seem to coincide with the Russian mentality, and good sales due to show only those brands that after a few years to adapt the separate collection guess the taste of our customers. The exception is the fashion brands, which are sold “in conjunction” with the overall image of the manufacturer of fashionable clothes and accessories. In this regard, young people from 18 to 30 years, which is an active fan of American fashion, American cinema and culture MTV, has been the main target audience and watch brand. And speaking of “fashion brand” in this case refers not only mark that is tied to the label of clothing, but in general, any watch brand, which is associated with the key symbols of youth culture. In Hamilton, there is one feature that allows you to emphasize the brand among other American manufacturers and assign a unique identification, attracting attention and Russian buyers. Hamilton – cult CineMark almost inextricably linked with the loudest Hollywood hits. Hamilton Company carefully prepared for the arrival of the Russian market, to be sure of success. And time was not accidental: it is now with us in the midst of a boom fashion brands. In addition, over the past three years, Hamilton has significantly changed and the image of its main collections, making it the most European – that is bound to affect the growth of sales of the brand in Europe itself. With the asset more than a century most brands (in which there is, for example, such an achievement as the first release in the history of clock with LED-technology), a wide range of collections from classic to ultra-modern design at a very loyal and price image, is close to fashion, the image of “the very hour of the film,” Mark Hamilton confident can count on the fact that the buyer will notice it. So, and appreciate. Hamilton came to Hollywood, where studio moguls do not yet know this phrase, as product placement – in 1961, the company signed a contract with Elvis Presley, that he was shot in Hamilton Ventura watch in the movie “Blue Hawaii.” A little later, in 1966, Hamilton watches quite incredible futuristic design appeared in the epic Stanley Kubrick’s “Space Odyssey 2001”. Since then, Hamilton has participated in a number of box-office hits, which if used posters as POS-materials, the watch shop in the lobby will become “Formula Kino”. After Ventura appeared on movie screens and clocks-selling Hamilton. Model of the famous collection Khaki (respectively, by the strap of the hacks) can be seen in action movies “U.S. Marshals,” “Chain Reaction”, “SWAT”, “Independence Day” and many others. And watch the other collection Ardmore played not a cameo in hits “Autumn in New York” and “Lethal Weapon – 4”: the first Ardmore serve as a kind engagement ring for the characters of Richard Gere and Winona Ryder, and in the second Hamilton Ardmore is a family heirloom Family hero Danny Glover. But perhaps the most famous Movie parts Hamilton took place in 1997 in the movie “Men in Black” and she again fell to Ventura. Interestingly, the film’s producer chose Hamilton Ventura model as the “Official Watch” of agents Kay and Jay – it seemed that the shiny black clock in the shape of the waxing moon is the best match cryptic style secret space agency. In the epic Hamilton present even one film where the storyline of the brand has been specially written into the script. In the movie “The Great Depression” by Stephen Sodeberga protagonist to survive, becoming a shop salesman hours Hamilton, which is the first step on the road to success. Indeed, Hamilton watches sold during the Great Depression of the 30s, and even earlier – in fact brand has its history in 1892 when he opened a small watch factory in Lancaster, Pennsylvania. As you know, the greatest honor and proof of excellence for every hour of the company at that time was the order for the party hours for the employees of the railway company, because of the accuracy of their chronometers dependent coherence messages trains. A year after its founding, the company introduced a pocket model Hamilton Broadway Limited, which quickly has been adopted by the railway departments of the United States. Accuracy, simplicity and reliability of these watches have gained such popularity that soon Broadway Limited received an official timepiece of the American Expeditionary Force. That clock was equipped with the legendary Hamilton 1st Infantry Division under General Pershing, who fought with the troops of the Kaiser during the First World War, watches Hamilton accompanied Admiral Byrd expedition to the North and South Poles, and James Whittaker – the first American to conquer Everest, also took with him in climbing watch Hamilton. 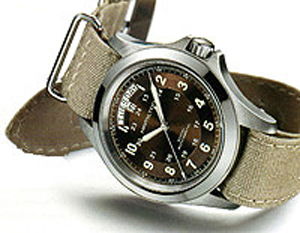 During World War II, Hamilton stopped production of normal hours and has created a line of special military models – with a round face, and Arabic markings on the strap of the hacks. Thus, a series of Khaki, which today is considered a cult, a watch with an extremely simple and ergonomic dial in ruggedized housing attracted the attention of all fans of outdoor activities. In 1957, the American company took another break, forever is inscribed her name in the history of watchmaking – in the wake of general enthusiasm with new technologies Hamilton created the world’s first electric watch. Incidentally, among the collectors of these models, despite their technical shortcomings, are not considered less valuable than the famous first quartz watch Seiko Astron. By the way, with the arrival on the market of Japanese quartz technology Hamilton, unlike many, did not surrender their positions: combining technology with competitors own development, in 1972 the company developed the first hours Pulsar, equipped with LED display LED. Today around the world Hamilton is associated not only with the name of democratic hour mark, but also a symbol of modern history zhivim hours of technical innovation. Today, Hamilton watches are manufactured in Switzerland and in quality fully meet the standards of accuracy and reliability of Swiss made. But there is one feature that distinguishes Hamilton among other Swiss brands – its unique and memorable design. From the very first collection of Broadway Limited, Hamilton worked for hours on the best designers who created not only a model, popular in their native U.S. market (for example, a series of iconic Yankees), but also a collection of enjoying international popularity. Today the Swatch Group, careful analysis of the legacy of Hamilton, to the best collection, adapting them to the tastes of today’s consumers. So, today, in the arsenal of Hamilton can see the following vivid series. Ardmore. Classic rectangular watch in steel or gold-plated case with a stylized Art Deco layout, first introduced in 1937. Vintage style of these models emphasize the black or silver dial and stitched leather straps. Ardmore may well act as a clock for the office, and combined with the clothes casual. The collection features both male and female models. Boulton. Perhaps the most “representative” series brand, established in 1941. Its distinctive feature – the body in the form of barely marked “holes”, slightly smoothing sharp corners rectangular dial. This stylish, immediately attract the attention of others. Khaki. Famous series of military watches, first introduced during World War II, now appears to the buyer in many variations from the classic chronograph housing 44 mm Khaki Aviation to multifunctional model with touch screen Khaki Multi-Touch, equipped with an alarm clock, compass, chronograph and also . The main feature of all models – military-design and user-friendly strap Khaki (also, there are options on the steel bracelet). Ventura. Most iconic series of the brand, in fact, “business card” Hamilton. The first model in the shape of a crescent was introduced in 1957 and was equipped with the world’s first electric clock mechanism. Ventura later became quartz, however, and today this model is unique and perhaps one of the most recognizable in the world. In 2004, we released a special series of men’s and women’s watches Ventura Diamond, incrusted with diamonds. Hamilton – cult CineMark almost inextricably linked with the loudest Hollywood hits. Hamilton watches are manufactured in Switzerland and are in compliance with the accuracy and reliability of Swiss made. But there is one feature that distinguishes Hamilton among other Swiss brands – its unique and memorable design.